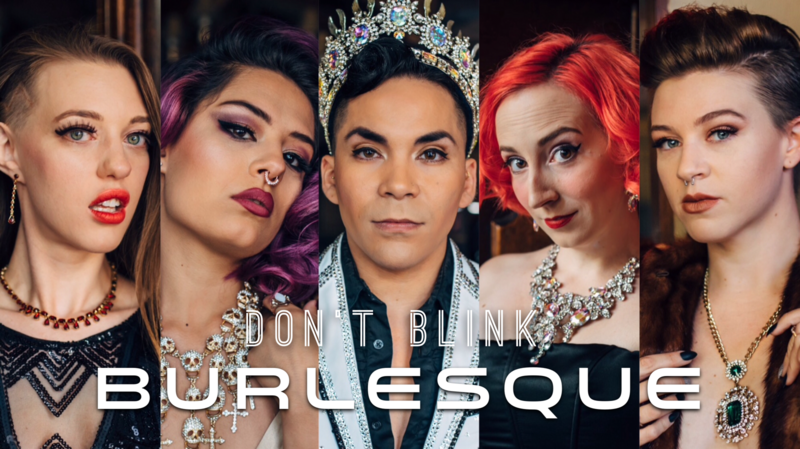 Don't Blink Burlesque – Don't Blink…you won't want to miss a moment! Don’t Blink…you won’t want to miss a single second! Don’t Blink Burlesque heats up the deserts of Tucson, AZ with their entertaining burlesque productions. Don’t Blink hosts a monthly show at The Hut (305 N. 4th Ave., Tucson, AZ) every Second Saturday and is available for booking your special event. Don’t Blink members travel around the country, showcasing their teasing talents in shows and festivals. Don’t Blink has been tantalizing audiences since 2012 with their innovative acts, tasteful teases, and sparkly costumes. Audience interaction is a special part of the Don’t Blink show, and shows are memorable and fun! They are honored to have been selected for four years running (2014, 2015, 2016, and 2017) for the Burlesque Hall of Fame Tournament of Tease in international competition for Best Large Group, and producer Matt Finish was awarded the 2015 Mr. Exotic World/King of Burlesque! Don’t Blink Burlesque has produced over 150 full-length burlesque shows and are also the proud hosts of the Arizona Burlesque Festival each fall in Tucson, AZ. Find Don’t Blink Burlesque on Facebook and Instagram. Have you seen Don’t Blink perform? Review us on Yelp!